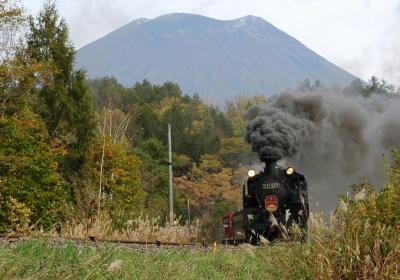 Autumn is upon us and once again the Niseko Steam Locomotive (SL) Train will commence its autumn route on the 15th September continuing until the 4th November, traveling on weekend and national holidays. This well maintained and preserved steam train has been running for the past 11 years as a major contributor to the tourism of Hokkaido during autumn. With beautiful mountain views of Mt Yotei through the mountain pass and spectacular scenery as the trees change colour, taking a journey on the Niseko SL is a must. Getting your hands on a reserved ticket can prove a little difficult due to its popularity but you can still enjoy the stunning scenery from the non-reserved carriages as it passes by. Travelling from Sapporo to Rankoshi and back the same day will take you through Otaru, Kutchan, Niseko and Konbu countryside. Most travellers will disembark at Kutchan or Niseko to partake in local lunch and onsen tours leaving plenty of room for the remainder of the journey. The antique carriages and period-specific uniforms worn by the conductors truly make this train ride a great experience. If you are in the area between now and the beginning of November why not take a ride to Niseko and come say hello. For more information please visit the JR website.